United States Sports Academy graduate Michael Santos has been named as the Assistant General Manager of the National Hockey League’s Florida Panthers. 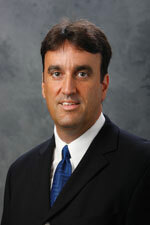 The 1989 master’s degree recipient spent the past four seasons as the director of hockey operations for the NHL’s Nashville Predators. He will now be responsible for negotiating player contracts, handling salary arbitrations, overseeing the club’s minor league affiliates, managing the club’s payroll and salary cap, as well as serving as the day-to-day contact of the hockey operations department. He previously worked for the Panthers from 2001-’03. “(The Academy) really gave me direction and the opportunity to learn how to synchronize business and the sports aspect of business,” Santos said. While attending the Academy, Santos began a public relations internship with the NHL, which led to a full-time position in the same department. After that, he worked for the New Haven (Conn.) Nighthawks of the American Hockey League (the highest level of minor league) for two years. He followed this up by working in Arena Operations for special events at the NHL front office. Santos, who has a bachelor’s degree in communications and English from Boston College, and a Juris Doctorate from St. John’s (N.Y.) University, has since spent five years with the New York Islanders and two years as the director of hockey operations/corporate counsel for the Panthers.